Why are these figures so high? One factor could be the state’s majority Latter-day Saint population. Members of the Church of Jesus Christ of Latter-day Saints rank highest among all religious groups for income donation,2 especially given the religion’s benchmark to donate 10% of all personal income. Another reason? Utah has a massive charity count of 8,582—583 of which are nonprofits alone.3 From environmental conservation efforts to humanitarian outreach, dive in below to see just how giving Utah is. 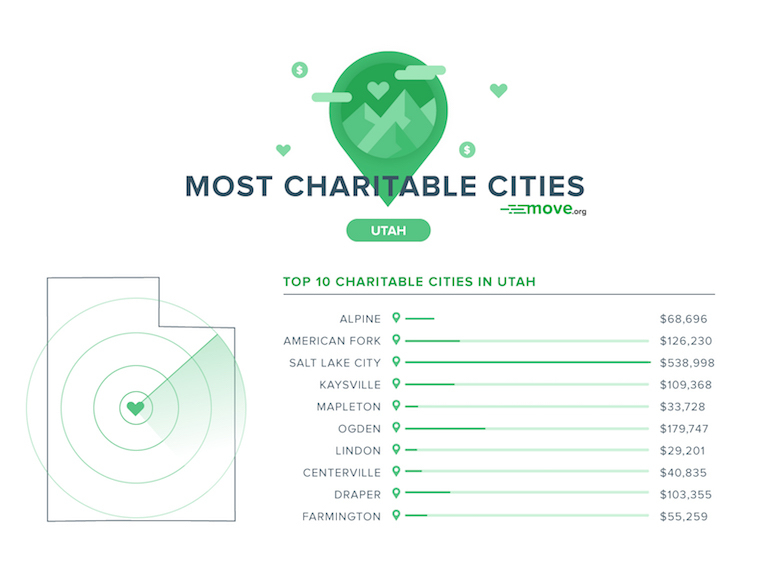 To determine the most charitable cities in Utah, we looked at 2016 IRS data as well as information from Charity Navigator. You can learn more about how we calculated our rankings in our methodology section. With the highest donation per person atop our list—a whopping $6.46—Alpine earns bragging rights for being the most charitable city in the 801. For a town with a population of around only 10,000, the donations in this Utah County city pile high. As number two on our list, American Fork makes impressive charitable efforts—its charity count of 140 being case in point. For example, compared to San Pablo, California, which has a population of 30,215,4 AF has ninety-five more charities5—despite having the slightly smaller population of the two. Boasting over half a million dollars given to charitable causes each year, Salt Lake City easily nabs the third spot on our list of Utah’s most generous cities. With a colossal 2,663 charity count, this University of Utah city claims the rights for having the most charities too. To put things in perspective, Denver, Colorado, has a population of 600,158—almost three times that of Salt Lake City—and its charity count numbers around only 1,000. Go Utes! For a city with a population of around 32,000 people, having close to one hundred charities is no small feat. Compared to Michigan City, Indiana, a city with a population of 31,000,7 Kaysville has almost three times the number of charities—way to be, Kaysville. With donations as high as $3.34 per person, Mapleton is up there for the most charitable cities. And although its number of charities is on the lower end, the city makes up for it by raking in over $33k in donations, despite only having 10k citizens. Between $179,747 in donations and a charity count of nearly 500, Ogden easily snags a spot as a top ten charitable city. Plus, according to the National and Community Service Organization, the city ranked number one in the country in 2015 for having the highest volunteer rate for a midsize city.8 With stats as good as Ogden’s, it’s no wonder this northern Utah city made the cut. Just below Mount Timpanogos sits Lindon, UT—a small city with a little bit of country and a whole lot of charity. At $29,201 donations a year, this Utah County community raises the bar for philanthropy, especially when you take into account that Lindon is one of the smallest cities on our list. And while its charity count is a little low, Lindon makes up for it with its $2.60-per-person yearly contribution. Although Centerville has a smaller charity count and donation average than other cities ranked further down the list, having an average contribution of $2.25 per person is pretty noteworthy for its size. Plus, 40k a year in charitable donations is no small chunk of charitable change, regardless of population size. Between a six-figure annual charitable donation and a charity count well over one hundred, Draper knows how to bring in the cash. The city’s sky-high charity count of 170 deserves a major callout—and with a population of 47,960 people there’s bound to be enough volunteers to keep those charities running. For being number ten on the list, Farmington still fares pretty competitively against the other cities on here. Home to over fifty charities, coupled with $55,259 in donations a year, Farmington makes it a point to give back. What do you think of Utah’s generosity—or charitable efforts in your own state? Shoot us your thoughts in the comments section below! To get our rankings, we looked at cities in Utah with a population of 10,000 or more. From there, we used information from Charity Navigator to determine the average number of charities per capita, as well as IRS data to calculate the average annual charitable contribution per person within each city. We then weighted both factors, giving 70% of the weight to the average charitable donation per person and 30% to the number of charities per capita. Donations from individuals and companies significantly impact how well charitable organizations can provide their services, so we weighted the number of charitable donations per person more heavily. Corporations, trusts, funds, foundations, etc.